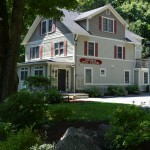 I can’t believe it is almost summer! Although not technically summer, the Memorial Day weekend, especially when sunny and warm, brings out the BBQ in all of us. Swimsuits come on, picnics for graduation appear, a relative’s wedding takes a weekend and the next thing you know the whole family is spending more time outdoors. This is a favorite time of year for our family with our two active boys and a growing puppy which makes us break out the hats, bug spray and the sunscreen to protect us from the newly changing environment. Fortunately, too much sun and sunburn is not a major issue for our pets, but pigmentation changes of the eye is a common observation by owners that prompts a visit to the eye clinic. We will review some of these entities here in case pigmentation of the eye is something of concern for you and your pet. Cysts inside the eye are a common and benign problem we see in dogs and, less commonly, cats on a regular basis. The ciliary body, which produces the fluid which bathes the front part of the eye, is lined by pigmented cells. In some instances, this tissue will bud off in the process of making fluid which causes a pigmented, fluid filled structure to peek out from behind the iris. As the processs continues, this cyst may release from behind the iris and float in the anterior chamber. As one may intuit, these cysts are typically round, see-through and mobile unless they become wedged between the clear cornea and the lens. This is a very common finding in the Goldern Retriever and Boston Terrier but can be seen in any breed. They are benign and warrant no treatment. 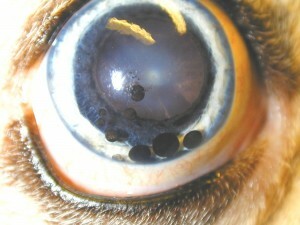 A melanoma in the iris or ciliary body of the dog is another common problem observed inside the eye. Although benign, meaning it will not spread outside of its location, it can be bad news for the eye as slow growth is expected. The presence of the mass can cause inflammation, cataract formation, retinal detachment and glaucoma. Usually, resection or laser destruction of the mass is not practical or successful unless quite small or easily approached. Therefore, removal of the eye to try and prevent it from becoming painful as well as confirming the benign nature of the mass by pathological evaluation is often advised. Eye removal sounds horrible but honestly dogs and cats do wonderfully with this surgery if warranted. 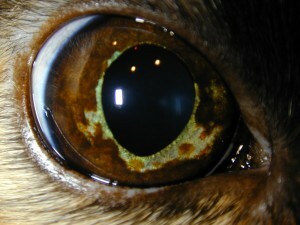 Different than dogs, melanoma in the cat eye is determined as diffuse meaning it is not localized to a single location. 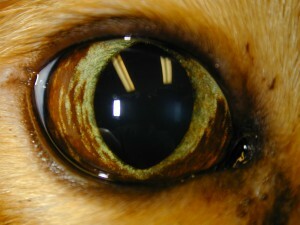 The iris can become spotted with pigmentation change and does not form a visible lump like it does in the dog. Although considered malignant, meaning it can spread to distant locations, the progression to this state can take years. To confuse the matter, cats can get benign freckles on the iris that look identical and are probably an early version of the same process before the cells transform into cancer cells. 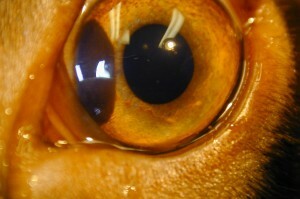 In more advanced cases, the iris in the region of the pigmentation may take on a velvety look and pigmented cells may be seen floating in the fluid in front of the iris. Because of the slow development, we now take digital photos of the iris and follow for change. If these changes become concerning, eye removal may be advised if a systemic workup for metastasis is negative. Occasionally, irises that have progressed in pigmentation that are removed still receive a histopathological diagnosis of melanosis which is taken as a good sign that we may have gotten it out before it transformed to a malignancy. Below are two pictures of irises, one with melanoma and one with melanosis…..difficult to tell which is which, isn’t it? I will talk about other diseases with a pigment component in the cornea in my next post….don’t forget to sunblock! 1 comment to Here Comes the Sun!